I have always admired the beautiful squash blossoms I see in my backyard and at my local farmers' market. But after all this time, it wasn't until last week that I finally bought some and brought them home, determined to stuff and fry them. I was planning on serving these for lunch with a simple salad and wanted to do more than just stuff them with goat cheese. I had recently picked up some delicious sweet Italian sausage that I threw into the mix to get something more substantial. Get creative with this recipe. Goat cheese is such a great background for so many flavors! Remove the sausage from its casing and cook, breaking apart into small pieces as you go. Allow the sausage to cool, mix together with the goat cheese and a pinch of celery salt. Set aside. Remove the internal stem and pollen from the blossoms and rinse the exterior to remove any dirt. Whisk egg in a bowl and place flour in a second bowl. Heat about a 1/2" of oil in a cast iron skillet for frying. Stuff each blossom with 1 T of cheese mixture. Dip each blossom in the egg and then dredge in the flour. Shallow fry a few blossoms at a time to keep from overcrowding the pan. Once golden brown, remove to paper towels to drain and sprinkle with a little more celery salt while still hot. Serve on their own as an appetizer or over a salad for a light lunch. Enjoy! I have never had squash blossoms. These sound quite tasty! What a perfect recipe for Halloween! I've never had them stuffed with a sausage mix, it sounds lovely. Unfortunately I'm working late tonight so there will be no yummy food like stuffed squash blossoms. I'll be eating left over potato soup and a sandwich. 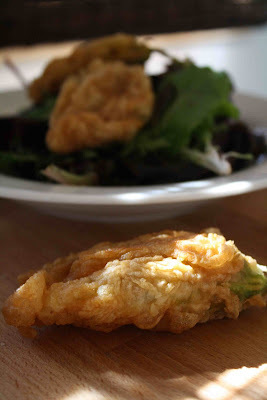 I've looked at squash blossoms often at the market but have never tried stuffing them. These look delicious. I've tagged you and left an award for you on my blog. I stop by often. I love fried squash blossoms, and have never thought to stuff them with anything other than cheese. sausage sounds awesome! those blossoms are so beautiful. So pretty. Never made these...but that might change now! Oh my! These sound sooo yummy!! I am sad that I no longer have any blossoms in the garden... till next year for me. I love stuffed zucchini flowers - and the sausage addition is incredible! Great work, thanks for sharing. Every. Single. Time. I see squash blossoms, I say I have to make them. They are so pretty. What am I waiting for anyway?